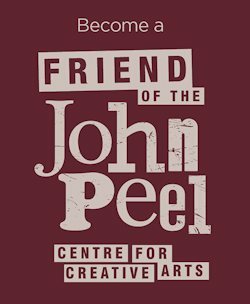 The John Peel Centre depends on the help of volunteers to assist in the running and development of the Centre but the we also offer a range of opportunities for people to develop their skills and interests by becoming involved in the care and development of the Centre. Volunteering at the John Peel Centre is an excellent way to stay active in the local community, giving you a fun chance to meet interesting new people from across East Anglia and further afield. Our volunteer family is made up of people from all backgrounds, utilising their talents in everything from account keeping to serving a thirst quenching pint. If you are passionate about the performing arts, and would like to help engage others in the community, we would love to hear from you. Volunteer experience can also be a valuable asset for your CV, increasing your chances of gaining employment, furthering your current career, or aiding a career change. , telling us how you would like to help, and what times you are available for volunteering. On the job training will also be offered if required. We are always on the lookout for bar staff, cleaners, front of house staff, marketing staff, and general helping hands.